IBOToolbox Scam Fake Traffic from Bots & More! Yes my friend, IBOToolbox/IBOsocial is indeed overrun with fake traffic using bots and IBOtoolbox is a Scam site. The profile pages at IBO are at IBOsocial and I myself was at one time a very active member at the site. I even recommended and referred IBO to many friends in the past, I do apologize and didn't know about the bots back then. Now I do know about the bots and even though I do have many friends at IBO, I am no longer a member and don't recommend the site to anyone. If you are a member and/or do become a member, I recommend not sharing your actual website because the bots will ruin your rankings at Google, Yahoo, Bing etc….. There are many wonderful people at IBO and you can indeed share your opportunities there successfully, just don't spend any money and/or much time there. Your banner ads that look like they're receiving clicks, maybe 10% of the clicks are real, the rest are bots. What is IBOToolbox – IBOsocial? If you aren't yet aware of IBOToolbox/IBOsocial then I'll share some popular reviews about it right here so that you will have a better understanding of the platform. IBOToolbox launched in 2010 and the original owner/founder was Paul Williams, in my opinion, IBO went downhill fast after the sale of the platform. The current owner is unknown but I do have a very good idea who owns IBO now and she has no clue as to how to run any business, let alone a platform for members. Thank you for asking & I will tell you that I was so surprised when I found out. IBO does have the opportunity to share ads via text, banners, YouTube videos etc… and in the beginning I would share basically only Affiliate links to sites such as Wealthy Affiliate, Global Moneyline, Social Media Traffic Exchange etc…… with some results. I decided to start sharing my content via my website posts and/or pages and saw traffic coming to my website so at first I was thrilled. That all changed when I started taking a better look at the stats, normally I try not to place too much emphasis on stats & instead more on results. When I took a closer look at the statistics, that is where I noticed that although I was achieving some results, I was also seeing a much higher bounce rate and less time on my posts. It was so drastic that my posts were receiving site views that weren't even 5 seconds …… Wow, why were so many people visiting and then deciding to leave so quick? At first when I saw my stats take a turn for the worst, I thought that it was me, so I took an even deeper look at my stats and that is how I found out that IBO was utilizing robots to send my ads fake hits and traffic. Even though I was only targeting my ads to the IBO wall, I was receiving clicks from their other associated sites like IBOTube, IBOGigs, IBOurl, IBOsearch, IBOList etc…. I immediately stopped sharing my website at IBO and my rankings with the search engines slowly started climbing back up and guess what, my stats went back to normal again. To test my theory about the use of robots, I decided to do a couple of things differently to see what the results would be. At IBO there are traffic leaders and the leader board resets daily and is based upon how much traffic goes to your IBOSocial profile page. I pointed my ads to go to my IBO profile page and almost immediately became a leader in traffic, ironic right? Well, I didn't stop there, I also uploaded a YouTube video and had the learn more link linked to my IBO page. My traffic to my profile page at IBO increased even more and I was even higher on the leader board for traffic at IBO. What I did next is even more telling …… I uploaded 13 YouTube videos (Not anything even remotely associated with IBO) and sent the learn more traffic to my IBOSocial page. From that point on, I was not only on the leader board, I was by far the #1 traffic leader at IBO. If you are a member at IBO, try it for yourself and you will also see. How do I know? Because I asked 2 friends who were new to IBO to try out this method and yes, they were both at the top within the traffic leader board within 24 hours. Club IBO – Should I Join? IBO does have an upgrade option and also an affiliate program within the platform. When referring others to IBO, You are supposed to receive 20% when that person purchases a traffic package. (Club IBO purchases don't qualify) As a Club IBO member you are said to receive 50% of your referrals advertising purchases that aren't ClubIBO memberships. Did you notice above that I said, “you are supposed to receive 20% and said to receive 50%” The reason that I said that is that I myself was cheated out of many commissions and know others that were as well. That being said, the “trainer” at IBO who I sincerely believe to be the owner also cheated me on another occasion. Why did I stay and why did I remain a Club IBO member even after she cheated me? Because the community is full of great friends of mine and for the most part, IBO is a place to share opportunities with others. Club IBO is only worth it because of the added exposure within the system as the membership is less than $20 per month. Don't share anything except for affiliate links, never ever share your website, because the bots are rampant there. Should I Share My Google Adsense Code on IBOSocial? IBO does say that you can share your Google Adsense code on your IBOsocial Profile Page and while that is indeed true, don't do it! Because although Google hasn't shut down IBO yet for the fake bots, I am confident that they will eventually. You don't want IBO to take you down with them, they are cheating those who pay Google every day for fake traffic to their Google AdWords. Do you pay Google via Google AdWords? My recommendation is that you turn IBO in for cheating you, view the YouTube video below to see how IBO not only cheats you with bots but also rewards its members with advertising credits for clicking on your ads. (View it at about the 40-minute mark. Remember, IBOToolbox/IBOSocial Scam does indeed utilize Fake Bots for Traffic so tread with caution in the event that you do decide to join and/or stay at IBO my friend. If you are an entrepreneur, a business, a shoe store, an affiliate or referral promotor, musician, artist, attorney, teacher, waitress, anything that requires a buyer or consumer or subscriber to something you have or are selling or promoting, then you need a market. Within that market are customers and those customers are often referred to as “leads”. Did I miss anyone or anything? Makes no difference if you are selling used cars, an MLM hope and dreams scheme, government secrets, herbal teas, gasoline MPG pellets, organic peanuts, car washing service, baby setting, medical treatment, therapy or trips to mars (via Elon Musk), you need a stream of customers and before they become customers, they were leads. For Sale or rent or DIY; your business depends on them. Typical sources are friends, relatives and acquaintances, but these classifications runs out very quickly and to achieve an equilibrium of cost, effect and achieving your objective, the holy grail of leads has always been a difficult and often foolish pursuit, until Markethive. The best relationship for leads is well, a relationship, a kindred foundation, a stream of “associates” who are exclusively connected to and drawn towards your inbound marketing portals, funnels and associations. These type of “relationships” are priceless and when nurtured with an ongoing two way engagement, collaboration and dialogue, will produce a lifetime sphere of influence. This is the “holy grail” of marketing. This is precisely what the Markethive Entrepreneur program delivers. Think about it. How many of you consider me your trusted friend, a mentor, even family. Then think about how that relationship evolved, how we got to meet each other, how you found yourself in my sphere. How over time trust developed and now we are long term solid friends. This is Inbound Marketing at it’s best. Markethive develops the best relationship associate level leads from the Entrepreneur program. If you are building a business, selling a service, just creating a large effective collaborative team, then the $100 per month Entrepreneur program is the best option for building your leads. Superior to trying to tell a story funnel capture pages. Superior to advertising a Facebook group via Facebook ads. Superior to it all. Give it a try. The best part? For $100 per month, you get over $5000 per month back and realistically, you might even get more than that back for life. Markethive, nothing like it, anywhere. But here. Would you sign up for a system giving away 500 MH crypto coins and a state of the art marketing system that has sold for $2000 or more per month by a similar platform that just sold to Adobe for 4.75 BILLION dollars? Do you want leads that are motivated by this offer, that give you a real verified name, a real verified email, a real verified phone, a real verified postal address, a selection of social network accounts and continue to engage and grow their account in Markethive (nurtured) with you. A true and valuable sphere of influence? This is exactly what the Entrepreneur upgrade does for you among all the other benefits. Tried and tested already. We are doing actually qualified tests with different mediums to drive leads. One such tests was with BITTER.IO which is a service in the crypto sphere offering a version of faucets by sharing web site visits. It is relatively affordable at $1 per 1000 visits. We did this with a capture page that promoted the Airdrop and Inbound Marketing tools. $1 procured 25 “associate” level leads within 3 days. By extrapolation, one year would produce over 3000 “associates” equating a matching airdrop of Markethive coins @ 1.5 million coins. Cost of this enterprising campaign would be $1 x 10 (1 month) for BITTER.IO @ $120 for a year and the Entrepreneur upgrade $100 x 12 (months) @ $1200 for a total cost of $1320 divided by 3000 “ASSOCIATES (leads)” making the cost per lead @ .44 each for leads that would legitimately be worth $200 per today’s cost of standards as researched by Hubspot. That is a value of $600,000 in today's market for exclusive high data vertical contacts to you. Not to mention the 1.5 million Markethive coin you also received by matching bonus via the Entrepreneur upgrade. To be conservatively speculative, the Markethive coin has the potential one year after launch of .25 per coin. Equates to $375,000.00 in value, speculative not promised. Drop it back to .05 per coin and you still make profit @ $75,000. You see, we built Markethive for the masses, the entrepreneurs, all of them, young, old, rich or poor, Markethive is design to honestly level the playing field. Markethive is here and your time has come. Hey! Want to engage in further lead acquiring testing? Contact me via Markethive messaging and let me know. I will help fund the advertising for your system to measure additional results. Markethive Needs You – Make Your Vote Count! As Associates of Markethive, we have just experienced our first of many Airdrops and the micropayments and tips are active. Now it’s time to get our coin on the Exchanges. First exchange being Raisex.io. Raisex Exchange is a blockchain platform that allows users to make payments, create and request loans and crowdfunding projects. 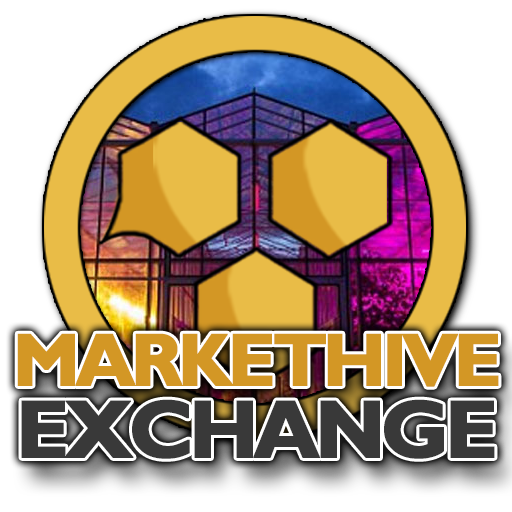 We need to raise as many votes as we can for the Markethive Coin (MHV) to be listed on this Exchange. We are allowed one free vote as a registered member of Raisex. We can also buy one vote using the RSX Token which you can buy from the trading page once registered. The minimum vote to be listed on the exchange is 100 votes. The votes for unlisted coins will remain for the week. If MHV does not get the minimum requirement of votes within that time frame, the coin will not be listed on the exchange and will continue to the next week on the list of potential coins. Let us all collaborate and get our coin on the exchange. The sooner the better! Thank you all in advance for your urgent attention on this. Markethive has made a very bold statement. We are so confident in this year, regardless of the crypto bear markets, the massive ICOs failures, the compounding Government regulations, the incessant attacks by the financial elite and the pounding of the negative media attention, that Markethive is laying it on the line. Even one of my mentors Tom Lee who is most outspoken and positive regarding Bitcoin is being slammed and called Dubious. Many critiques are predicting the total demise of Bitcoin. I disagree, but then I could be wrong. This is why I am claiming and giving Bitcoin value of $15,000 for the purchase of one of our ILPs which are valued at $15,000. 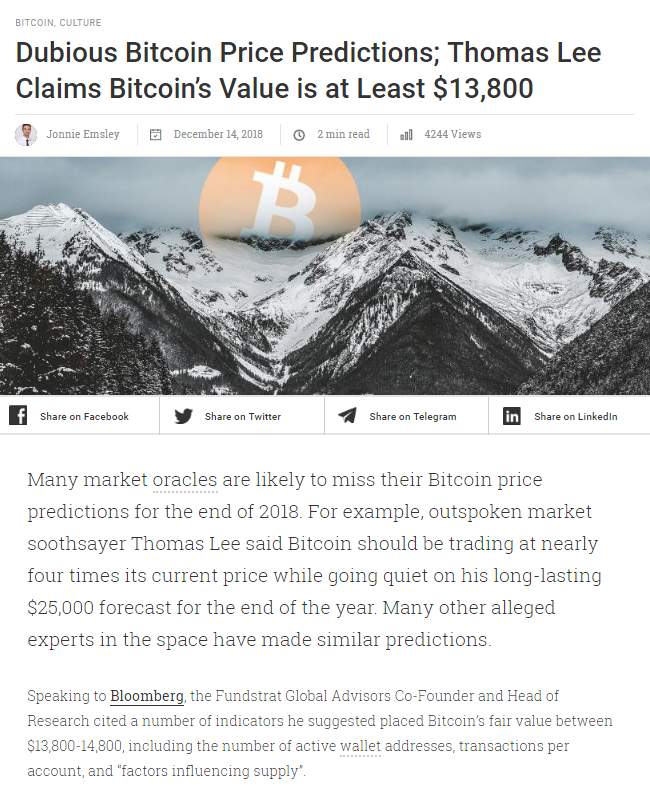 I think Thomas Lee is brilliant and correct in his assessment that even though the market has degraded Bitcoin it holds a greater value than we realize. We have been in a long pre-launch crowdfunding mode since April 2018. We have raised over $500,000 since we started Markethive and have been able to build the most advanced Inbound Marketing platform (rooted in my previous 20 year company Veretekk) integrated into a powerful comprehensive social network. Now we are building a series of integrated commerce platforms. An open service freelance platform, a media oriented (video, audio, copy, animation, production services) platform and a crypto | fiat exchange and platform. Since we began the automated marketing tech platforms back in the mid-90s called Veretekk (the first Inbound Marketing Platform by 20 years) we built this before Google was even a thought, back when AltaVista was the dominant search solution. Here is the mission statement of Veretekk back in 2002. Sounds just like Inbound Marketing today, yes? Inetekk's new Veretekk system has in-depth sophistication with ease of use and navigation. Basically, you use our system to build massive verified email lists to market your portfolio of free Inetekk services (ie: Free FFA lead systems, free search engine submissions, free vacation coupons, free software, free websites, free ebooks, etc. that have real value) which in turn, gets extensive prospect database profiles (like their phone numbers) into your management database (We call it your "Lead Processing Center), so you can develop "real" relationships which build your sphere of influence. This sphere of influence then enables you to build a substantial organization for "YOUR OPPORTUNITY", not OURS! Additionally, you also build your verified email database of 1,000s of addresses allowing you to send a weekly opportunity/marketing/newsletter type of publication with your Drip Control Panel "Semi Autoresponder". Quoted from Archive.org’s historical capture of Veretrekk April 01, 2002. 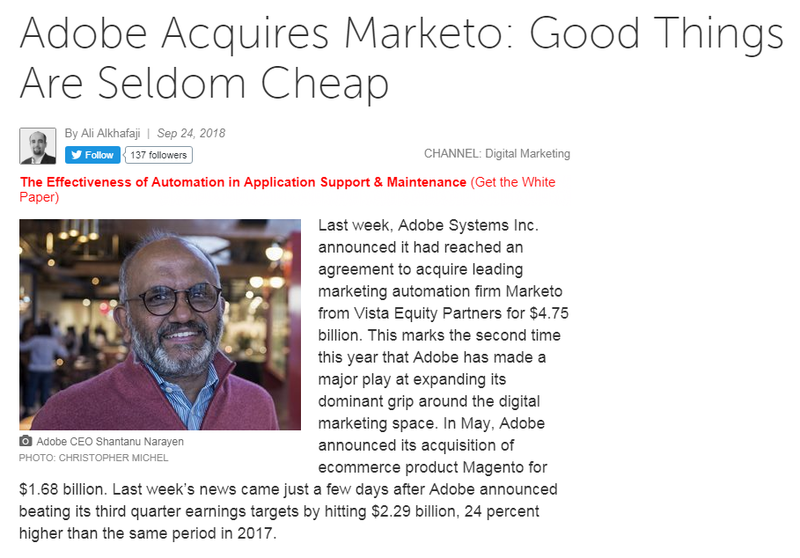 Interesting to note, Marketo, a recent candidate building and offering a similar Inbound Marketing platform to ours, to the high-end fortune 500 companies, just sold to Adobe for 4.75 billion dollars. That is right, a system nearly identical to ours. A system that was profiled after our foundational first platform called Veretekk. Back then we called it Automated Marketing. Today it is called Inbound Marketing. “Marketo, Inc. is a software company focused on account-based marketing, including email, mobile, social, digital ads, web management, and analytics”. Sound familiar? Because it is! But we are far different in scope and magnitude. Price, Markethive’s entire lineup of Inbound Marketing tools is free for life. No limit on leads, no limit on email data. No limit on campaigns. Marketo lineup ranges from $1,995 per month to $7,195 per month and tops out at 500,000 known leads. Select is the top tier in the small and medium business line-up and ranges from $3,195 to $11,995 per month, topping out at 1 million known leads. Marketo is an Inbound Marketing platform, and that is all they are. All $4.75 billion dollars’ worth. Markethive has also delivered another first, the ILP to replace the problematic ICOs. ICOs sell their pre-coin tokens at a price based on the speculation the coin will pump and bring in a return. This has fostered a culture of deception and after 2 years of ICOs raking in billions of dollars in Ethereum and Bitcoin, there is only a handful of legitimate ICOs actually delivering. 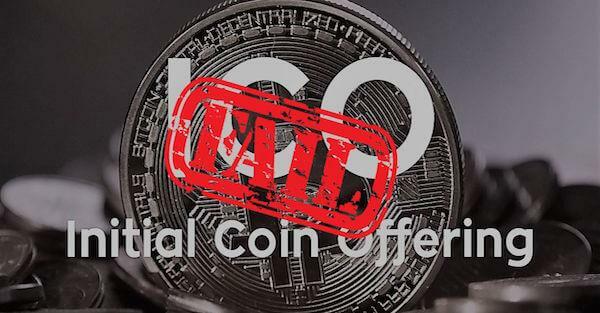 ICO means Initial Coin Offering and as such, they are considered securities, earning SEC scorn and enforcement and added regulations making the market even more speculative and in many cases legally questionable. Markethive’s Initial Loan Procurement is a new way to finance projects by utilizing blockchain and crowdfunding. It provides individual creditors an opportunity to invest in Markethive and get interest payment on a monthly or annual basis. This new method of fundraising was originally called the BOD (pre blockchain) from Markethive four years ago (2014) and recently another company called Blockhive has released a similar version of their own. Instead of raising funds using ICO, Markethive has launched a post-ICO funding model that is based on transferable credit. The model is referred to as Initial Loan Procurement (ILP). 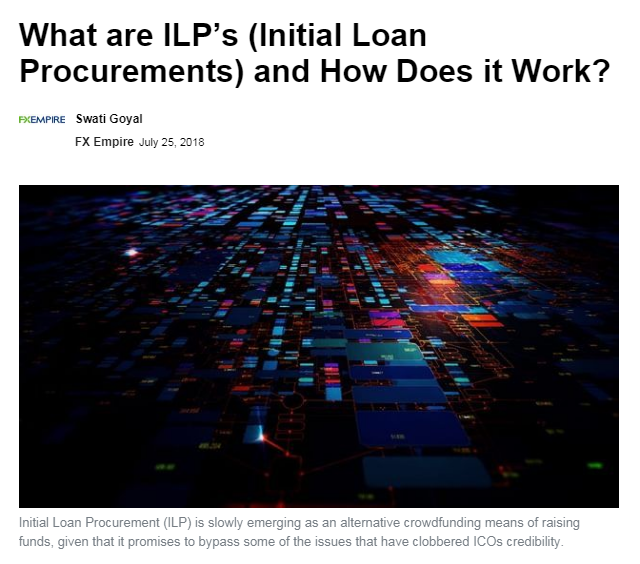 The ILP is a loan agreement that allows Markethive to get funding in order to expand its ecosystem while allowing creditors to earn interest from the money loaned. The loan agreement will be executed on Markethive’s blockchain platform. 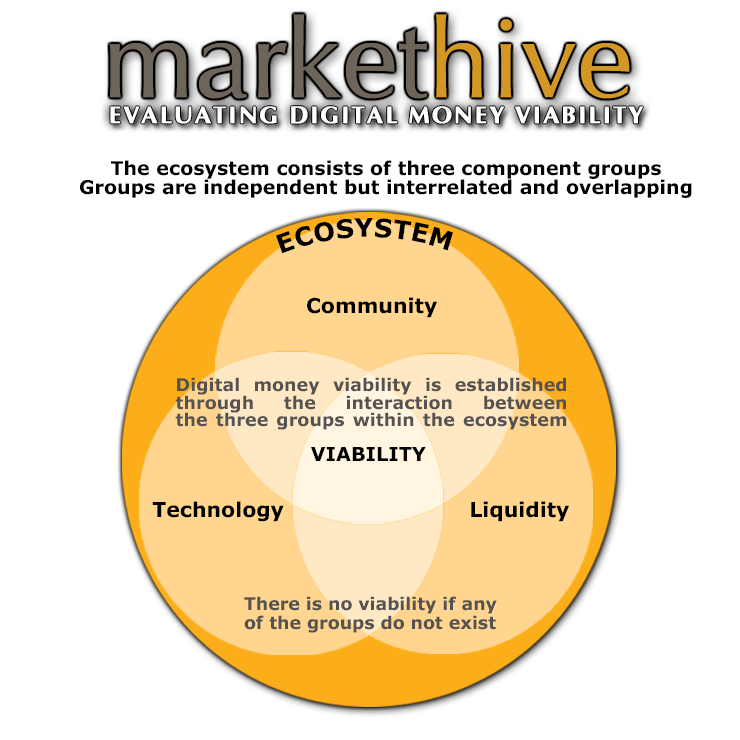 Creditors get to earn passive income from Markethive when they participate in the platforms ILP. The creditors will get an interest payment of their share of 20% of the annual operating profits produced by Markethive. The payment will be paid in ETH directly to the creditor’s contact address. The principal amount will be repaid to the creditors who hold the loan agreements until the maturity date calculated to be 20 years. This ILP is transferable and renewable. Interest will be paid to creditors who hold the loan agreements on the distribution date. To secure the right of interest payment, creditors must provide ID verification and satisfactorily complete and sign the loan contract. The distribution date will be announced at least two weeks before the advance day. All the money transactions including the incoming and outgoing loan and interest payments will be based on USDA but made in ETH. Creditors, after making loans to the platform and digitally signing loan agreements, will receive FSC tokens. The interest paid on the loans will be based on the loan balance but not on the FSC tokens balance. 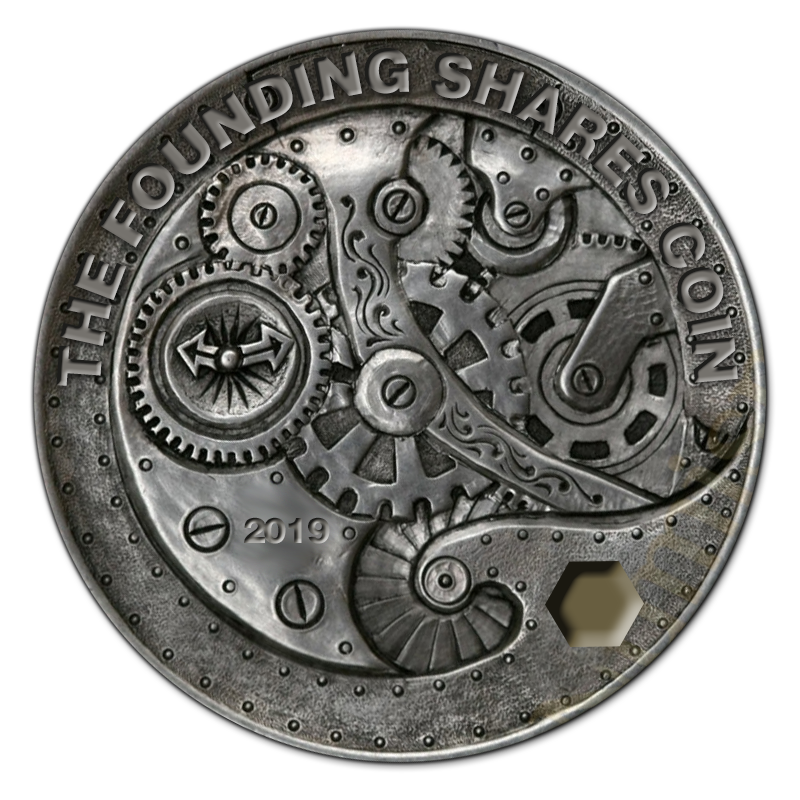 FSC tokens are Future Loan Access Tokens (FLATs) that also allows the creditors to transfer their loan agreements to others in the Markethive Founders Shares Tokens exchange. The loan amount equivalent to one FSC token is currently at phase 2 value of $15,000. The pre-launch crowdfunding is already underway starting on April 2018. We are currently in phase 2 of 4 phases. The maximum tokens issued are 1000 available during the public ILP. Contributors are expected to register and set up an account on Markethive and sign the loan agreement before sending Bitcoin contribution to the Markethive ILP project address. The best thing about the digital loan procurement model is that it has clear legal parameters that already govern existing credit markets. Contributors in the ILP period can be assured that their funds are protected by legally binding loan agreements regulations. The interest earned will also fall under the rules used in the jurisdiction of the token owner. Another benefit of this model is that it sidesteps the disadvantages that come with over tokenization where projects using the token sale to raise funds damage the utility of the token in the economy for which it was designed. We are in phase 2. We have 125 ILP tokens available in each phase. Right now there are 100 left. We want to secure the completion of our platform this month if possible. With Bitcoin getting slammed pretty much the entire year of 2018 and many still predict Bitcoin will continue to slide, we have a promotion. This promotion is based upon my perspective of the industry. 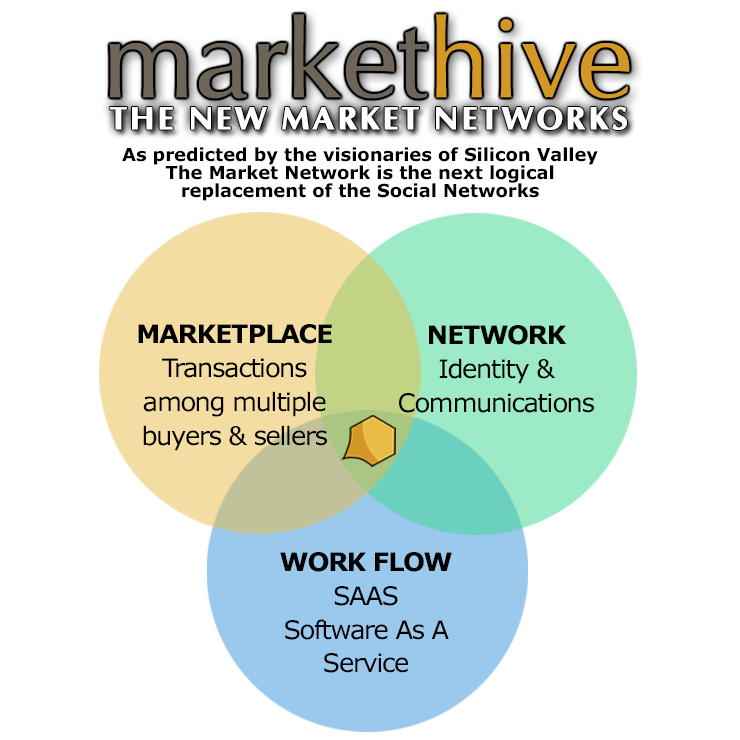 It is also based upon the fact, I know and have demonstrated that Markethive is worth a similar value as Marketo, that Markethive is ahead of the curve and is the only fully secured, private blockchain social network. That in fact we are a Market Network as pointed out by Techcrunch and many other market predictors. Quoted “Market networks will produce a new class of unicorn companies and impact how millions of service professionals will work and earn their living”. A unicorn is a privately held startup company valued at over $1 billion. We are ready to accept just 1 Bitcoin as payment in full for our 2nd phase ILP tokens which are listed at $15,000. This promotion is limited to 100 first come first serve. Is Markethive worth this risk? 6. A similar company Marketo with a similar system sold for $4.75 billion to Adobe. 8. Our potential global market numbers above 800 million people. 10. Nearly 1000 Crypto projects died in 2018. We are thriving. 18. We are delivering next level privacy and security as a block chained social network. 20. We are transparent and run a live webinar every week. 21. 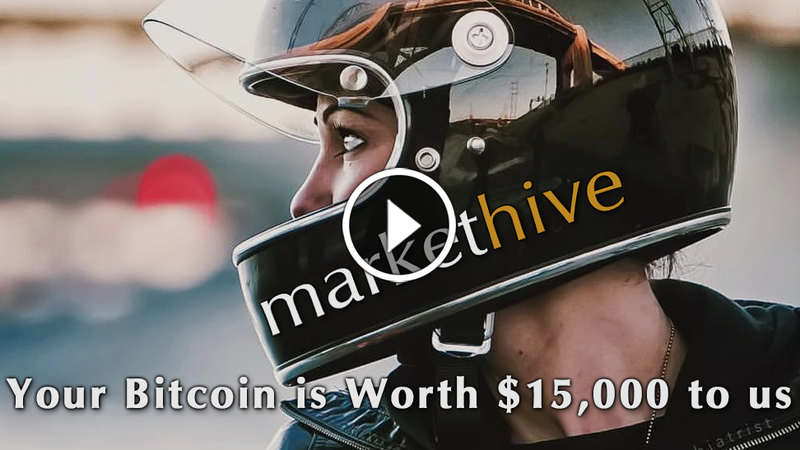 Markethive will be the only Market Network that pays people to use it, pays people to learn, pays people to share. 22. Like Paypal went viral giving away $5 per new subscriber, Markethive is releasing this month our infinity Airdrop paying every new member 500 coins per signup. There is no better offer in the crypto sphere, or social network sphere or the marketing sphere. Got Bitcoin? Excellent. Don’t have a Bitcoin account? We can help you there too. You owe it to yourself to visit us this weekend on our live conferences. See our calendar of events here. Lost your account? Need an account? Or Login to your account at the same address. What ifMarkethive grows to just 10% the size of LinkedIn? LinkedIn’s last quarterly reported $1.3billion revenue. 10% of that times 20% towards the Markethive ILP share divided by the maximum of 1000 shares delivers a projected income of $26,000 per quarter for 20 years and longer. This is as real as it gets. We are going to become a huge platform in the near future. We are credible and have skin in this as well. You cannot find a better offer for the small risk we are offering you. Will I see you this weekend? I certainly hope so. Articles are being written. Press releases are being published. When the tipping point occurs, hang on. The popular advertising site, Bitter.io is proving to be very lucrative. A simple system that attracts cryptocurrency, ICO and blockchain enthusiasts on a global level. The users on this platform are very crypto-conscious and are looking for opportunities in the industry. They are also advertisers and marketers requiring a system such as Markethive. I recently started a campaign spending only $10 worth of Bitcoin, which gives a total of 10,000 clicks. Generally, these campaigns run for around 3 days, or until all 10,000 hits have been executed. Although results can vary, this particular campaign resulted in 25 signups intoMarkethive over the 3 day period. So $10 worth of bitcoin produced 25 new Markethive associates which equate to $0.40c a lead! That is very inexpensive considering the information I was able to capture. I now have their email, phone number and Social Media account they clicked on to sign up. Additionally, they have subscribed to the Markethive autoresponder email system and receiving emails daily for the next 30 days. As we move forward with the system updates and launch of the Airdrops and micropayments, the email broadcasting feature is a great way to nurture the relationship. Given the current trend and news of ICO's also airdrops and the impact it has had on the crypto community at large, I believe was the reason this campaign was a success. Furthermore, the changes taking place along with the privacy and data issues of Social Media are escalating and people are looking for other options. Here is how I see this. The Markethive system was designed to create these results. After all, we are giving away a system very similar to what an Inbound Marketing company called Marketo (sold for over $2000 per month) away for free. Plus we are also offering our first Airdrop of 500 coins just to sign up into Markethive for free. A pretty attractive offer, yes? With the Entrepreneur upgrade program, we also match those 500 coin drops to your account. In other words, When someone signs up through your account, AND, you are upgraded to the Entrepreneur program, we also give you 500 coins. Deb has shown some data that I can use to illustrate the lucrative nature of what we have delivered to you. She put 25 people into Markethive, in 3 days, for $10. In one year we can speculate Markethive coin running at a nickel per coin? I mean Steemit's coin is at $35 as of this writing and the entire crypto coin market is way way waaayyy down. So .05 per coin is reasonable to make this example. Are we good with that? Because at one nickel per coin times your 500 coins you get for signing up into Markethive and the 3000 subscribers that you brought through you while upgraded to Entrepreneur, 3000 x 500 + 500= 1,500,500 (One Million Five Hundred Thousand and Five Hundred) coins x .05 (nickel) = $75,025 return. Not too bad. Now you see why Deb is so excited she is screaming day and night. Well not really, but she should be. You also have to take into consideration the Entrepreneur program costs $100 per month as well, that being an additional $1200 at the end of the year. But the Entrepreneur program is generous, and also pays you back more than you pay in. Literally! It returns a 10% of an ILP. If you know what an ILP is, well more excitement. Have you been keeping up with the latest digital marketing trends for this year? If you are like most, it can be tough to find the time to stay abreast of the best practices and techniques to keep in mind. This can place you at a very real disadvantage and you could soon find that your organization is suffering as a result. To save time and energy, let's take a look at the top five trends which experts believe will dominate the remainder of this year. According to the latest sources, marketing automation will have a 20% greater impact within the digital world when compared to 2015 (1). There are two reasons behind this observation. First, specialists are increasingly realizing that they require a greater amount of flexibility in terms of time to connect with their audiences. Automated software can help to bridge this gap. Secondly, the software itself is becoming more advanced and intuitive. For example, the free Inbound Marketing System called Markethive, is a Market-Network that has all the marketing tools you could ever need, it's a content marketer's "dream come true"! This trend has actually carried over from last year, and for good reason. We have always said that content is king, and these days, its reign is supreme. Generic texts and other “fluff” simply won't do the trick in 2016. Content needs to be centered around the needs of the user as opposed to the search engine. Organic content will rank higher and generate more interest; both important to increasing conversion rates. This is another metric that cannot be overstated. Once again, mobile-friendly architecture should really come as no great surprise. Recent figures have pointed out that there are no less than 7.19 BILLION active mobile phones in the world (2). This is higher than the population of the earth! Smart marketers are now understanding that the future of any digital campaign relies upon tapping into this massive infrastructure. Be ready to see most pages optimized for mobile phones as well as the humble app take its place within the forefront of advertising. While this hardware has been around for the past five years or so, it is only recently that it has become affordable for the average consumer. From smart watches to Oculus Rift and other unique devices, it seems as if the dreams of science fiction writers are soon to become a reality. Where does wearable technology fit into the world of digital marketing? Many companies are now developing unique applications to enhance the products that they are offering. In doing so, they hope to tap into a tech-savvy demographic that represents the younger generation. 2016 is likely to be the first year in which such an approach hits the mainstream market. Better CRM and CMS systems have given rise to the prevalence of big data within the marketing world. It is now easier to interpret and implement observations such as buying habits, user demographics and location. This should all enables businesses to better target their existing audience while also expanding this audience to include a wider consumer base. However, the downside to this is that competition is likely to be quite fierce. This is the main reason why by data needs to be combined with small data in order to address the very human side of any sales campaign. We can see that some trends are a continuation of the previous year while others could very well define the ways in which marketing campaigns are constructed into the future. Recognizing these tendencies is the first step towards developing an effective strategy while placing all of your efforts in the right direction. Encountering the most effective marketing techniques is now more difficult than ever before. The good news is that if you understand a few simple concepts, you will be able to gain a valuable edge over your competitors. We often hear such terms as SEO, web design, social media and big data. Still, one concept which is overlooked is the difference between an article and other forms of advertising such as pay-per-click services. Why are articles still thought to be the best way of reaching your audience and what advantages are they able to provide? The answers may surprise you! These can be much more effective to generate repeat revenue than a short-lived advertisement. Long-tail keywords are now very important within the world of digital marketing. First, they are able to cater to the discrete needs of the individual performing an online search (2). Long-tail keywords will also appear to be less “clumsy” within a content-laden article. Articles have always had a rather personal edge when compared to an advertisement destined for hundreds or thousands of potential consumers. These days, people are more fickle than ever before in terms of what they choose to read. If they feel that their needs are not being addressed, they are much more likely to move on and look for greener digital pastures. Articles have the innate ability to target these desires and therefore, the product or service being offered tends to be more appealing. Most (not all) advertisements tend to work with a limited amount of space or text. Whether referring to a pop-up ad or a widget within a website, only a certain number of details will be observed. It can be hard to convey the main points of your product within these confines. Thanks to modern coding techniques, articles are able to offer videos, infographics, flash presentations and numerous links to other sites (think of a good SlideShare presentation as an example here). This can be accomplished without appearing to overwhelm the reader. Many individuals who click on a link within a short advertisement are only mildly curious. So, conversion rates will be rather low. When this very same link is placed at the end of the article, the reader is much more likely to take action. He or she is likely to have read the entire piece; thus appreciating what you are offering in more detail. So, qualifying nurtured leads is much more of a reality. Now, this is not to say that advertising is useless within the digital domain. We are rather pointing out that a well-presented article can have a massively positive impact without detracting from the appeal of what it is that you are offering. 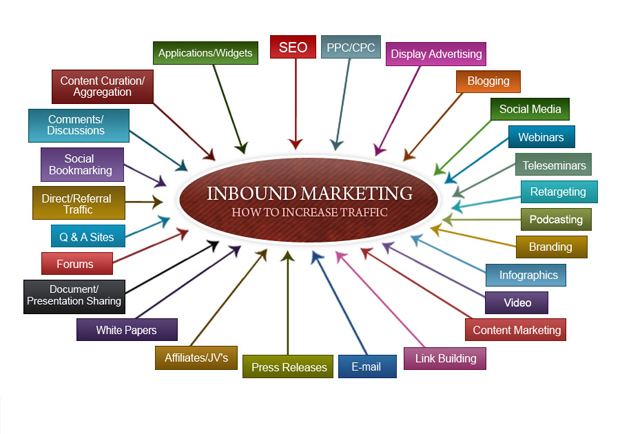 Inbound marketing refers to the strategy of using content (such as blog posts, videos, eBooks and other valuable reference materials) and search engine optimization (SEO) to draw customers to your business, as opposed to outbound methods like cold calling and email marketing. While outbound marketing is an effective way to find new customers and maintain relationships with existing ones, inbound marketing is quickly becoming the best way to reach people you do not know and who do not know you, but who are looking for the products and services you are offering. The following five inbound marketing tips will help you grow your business using the power of the Internet. One of the basics of inbound marketing is having a helpful, useful Web site that makes it easy for customers to find the information they are looking for. A site that is easy to use will bring customers back, and a good design is critical for this. You can use Web-based tools like WordPress to help build your site and manage the content. Once your Web site is live, you need to make sure customers can find it. SEO will help with that. When you "optimize" your site for search engines, you are trying to control how well your site ranks when a potential customer searches for a product or service you sell, or asks a question related to your business or expertise. There are many ways to optimize your Web site, including cross-linking and using keywords, but there are no shortcuts; never trust anyone who claims to be able to improve your site's ranking considerably without adding high-quality, relevant content to the site. Start by maintaining a blog and posting to it often. If you don't know what to write about, look for other businesses that are creating content and see what they are doing. For instance, if you are a contractor, you can write about what customers should look for in high quality homes. Ask your vendors and suppliers to link to your site in exchange for you writing about their products and linking back to them. This combination of content and linking should improve your SEO quickly. You can create the nicest Web site and write the best blog post, but unless you promote them, they will stay hidden. Include a link to your Web site in the default signature field of your email and your social media profiles. When you have created a new blog post, share it on Facebook, Twitter, LinkedIn and other social sites you use, not to mention in your email marketing messages. Connect with others in your industry, and see if any of your peers will share your blog post with their networks. Just as you want to expand your business, you want to expand your content offerings. Start looking through your blog for common themes you have written about. Can you put together a short eBook about what consumers need to know about home inspections using content you have already written? This has real value, and since you are using existing content, it will not take a lot of time. Better yet, it will give prospective customers more assurance that you are an expert in your field. You can also create tools for customers, such as a mortgage calculator or a design template that they can use when decorating their home. Providing these items on a regular basis will give you a steady flow of Web site traffic. 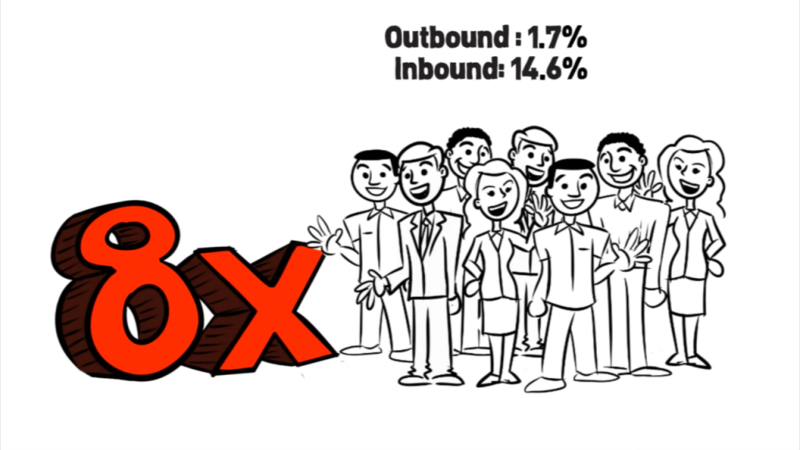 Do you know where your inbound traffic is coming from? Use a tool like Google Analytics to keep tabs on which sources are driving people to your Web site, and take advantage of that information. With Google Analytics, you will get an in depth peek into just who is visiting your Web site, what kind of content they are looking for, how long they are staying on your site before going elsewhere, what they are clicking and, most important, whether they are converting into customers. This will help you refine your strategy, and will also help you experiment along the way. For example, if you see that Facebook or Twitter are driving most of your traffic, you can devote more attention to engaging there. If Web searches are accounting for a good percentage, you can discover the specific words that people are using to find you, and then incorporate them into your content moving forward. You cannot act if you do not know, so take the steps necessary to learn more. Building your Web site and drawing traffic is the core of these inbound marketing tips. By creating interest in your Web content, you can bring in customers motivated to spend money on your product or service and then hook them with your expertise. Using these inbound marketing tips is a fantastic method to grow your business.